It’s amusing to see adults get excited about buying Girl Scout cookies. 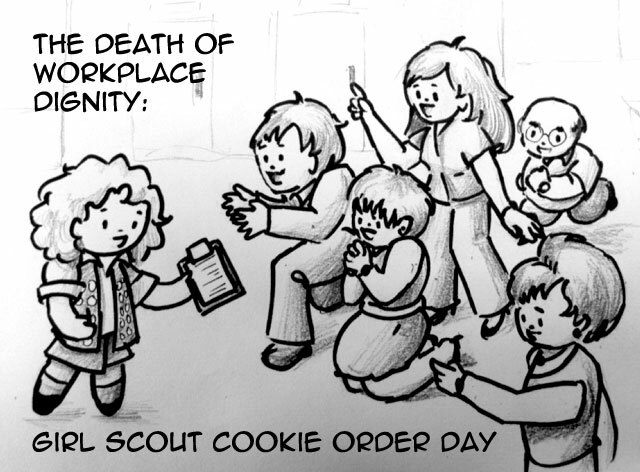 Happy is the Girl Scout who has access to a large corporate office. To her go the spoils. Seriously, this is a great cause. If you’re looking for cookies and don’t know a scout, you can go here to locate one. This entry was posted in Art, drawing, Humor and tagged cartoon, comic, cookies, funny, girl scout, girl scout cookies, Humor, office. Bookmark the permalink.